The New Albany Farmer’s Market is Open! 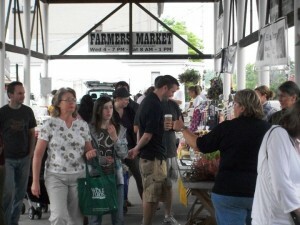 Last Saturday was opening day at the New Albany Farmer’s Market and what a day it was! We has a very brief bout of misty rain, they the clouds rolled away and the sun shone bright. That is quit typical of the Lord’s blessings at the farmer’s market. In the four years we have been selling at the market I can count on both hands the number of times it has rained on us. We have been blessed by great weather and even better customers. Last week was no exception. Thanks to all our return customers, we were so glad to see each and everyone of you. We also want to welcome all of the new customers that stopped by this week, we look forward to your return visits. Last week we had butter crunch lettuce, bok-choy, Chinese cabbage, kale, mustard greens, spinach, and mixed baby lettuces. We sold out of our baby lettuces and butter crunch by 10 am, this week we will bring plenty more so we don’t run out too soon. We also had our fresh farm eggs available. We will continue to have them all season. 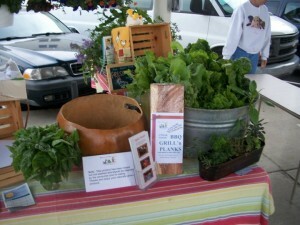 We will again have lots of fresh greens, lettuces, herbs and plants for sale. This week we will have STRAWBERRIES! I have been eating a few here and there waiting for them to ripen, but yesterday we picked our first gallon and they are wonderful! I had a bowl last night and can’t wait to have another when I finish this post. 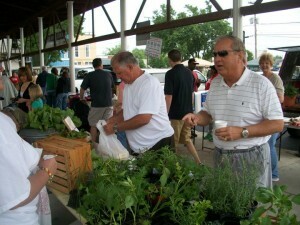 The market opens at 8am Saturday morning, come early for the best selections. We hope to see you at the market! Opening day 10 am, and we are already sold out of lettuce! Mayor England stops by for a chat, while Mr King purchases eggs.